Looking for a compact luggage piece that’s perfect for short trips? You won’t go wrong with a wheeled duffel bag. Rolling duffel bags are lightweight and easy to transport. They offer the convenience of mobility while travelling without having to sacrifice the ability to bring all the travel gear you need for your trip. These types of bags can pack lots of stuff but won’t look too rigid or formal. They are ideal for short trips, usually less than four weeks. Their wheels help take the weight off your shoulders. If you don’t like carrying your luggage on the shoulders, you can simply roll it through airports and paved streets. Rolling duffel bags come in a wide selection of models, designs, sizes, and colours so you can easily get a piece that suits your specific needs and preferences. Here, we review seven best wheeled duffle bags that not only balance elegance and durability but are also convenient for moving around. The luggage pieces are designed for versatility, and are ideal for everything from a weekend expedition to a grand tour across borders. After a long day of travel, exhaustion can set in leaving you without the energy to carry your luggage over rough pathways, cobblestones, or up a flight of stairs. Let the awesome Patagonia Black Hole Wheeled Duffel Bag save the day as you watch its over-sized 3.5-inch wheels go over virtually any surface. Moreover, you can easily roll this wheeled duffel down tight spaces and crowded areas, thanks to its narrow wheelbase. You can extend the handle up to 36 inches, making it easy to manoeuvre. 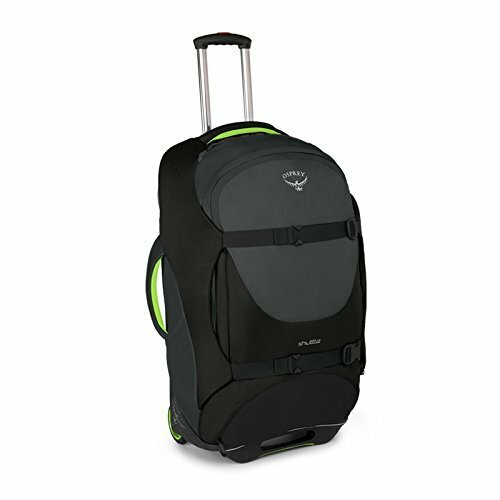 You can even place another piece of luggage over the handle as the bag boasts a sturdy frame and chassis. If you’re an outdoor enthusiast, the Patagonia Black Hole makes a great duffel bag for you. It sports a burly construction and exceptionally water-resistant material. It also has daisy chains on all its four sides, making it easy to attach to virtually anything. Moreover, you don’t have to worry about using the bag when you have little gear to carry. The bag remains upright even when it’s half full. One notable shortcoming about the Black Hole duffel bag is that you can’t use the large external pocket when the bag is full. The pocket also goes very deep and may make retrieving small items difficult. Nonetheless, you can keep some of your quick-access items in the two mesh pockets located underneath the bag’s lid. This somewhat compensates for the less user-friendly large pocket. If you’re looking for luggage that’s conveniently sized for short-term travels but still rugged enough to withstand rough adventures, you can’t go wrong withThe North Face Rolling Thunder 22-Inch Wheeled Duffel. This carry-on luggage piece features a lightweight, user-friendly design. Its 1000D polyester material is paired with rugged nylon, so you don’t have to worry about the bag being damaged by any abrasions and wet surfaces. You can easily roll this bag over virtually any surface, including cobblestone pathways and muddy terrain, thanks to its lugged wheels. The telescoping handle makes it even easier to drag around. The North Face Rolling Thunder features an external zippered pocket, which is designed to allow you to grab an item without having to remove the bag from an airline’s overhead compartment. It also features mesh internal pockets that will enable you to keep your smaller things organized. With this bag, you’ll have an easier time walking through busy airports and crowded streets, thanks to a Sherpa strap that allows you to secure your duffel or backpack to the face of the bag. It’s also equipped with daisy chains where you can attach additional gear. 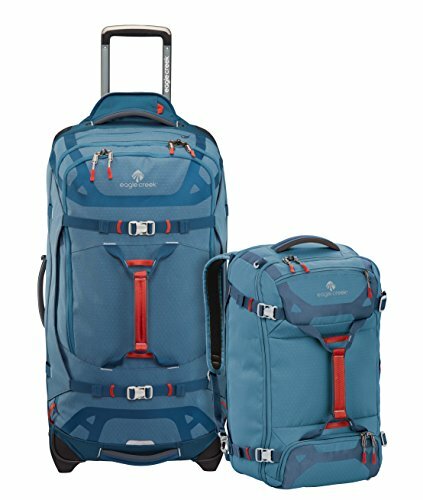 If you’re looking for a hardy, drag-through-the-dirt duffel bag, you should consider the Osprey 100L Shuttle Wheeled Luggage. This bag is designed to meet the needs of an adventurer traveller, thanks to its extra-large sealed bearing wheels and 100-litre space. Made of lightweight but durable 420D nylon, this duffle bag has quite a modest weight for its large size. The light weight makes it a great choice if you often fly as every gram counts. The nylon fabric is combined with foam padding, which does an excellent job of protecting your cargo when the bag is subjected to the rigours of air travel. The compression straps not only protect the bag from blowing out when you decide to carry your entire possessions, but they also protect the zippers. It’s more than just a duffel bag with wheels. Its robust off-road type chassis and wheels make pulling it on rugged train a breeze and you won’t even feel the weight. 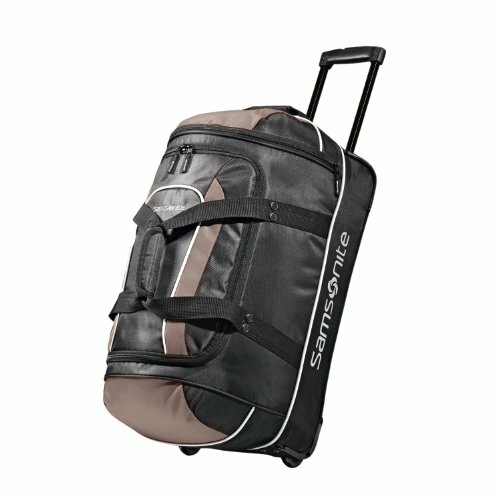 If you are looking for a duffel bag that you can easily roll or carry as a backpack depending on the situation, consider buying the High Sierra AT7 Wheel Duffel with Backpack Straps. This duffel bag is equipped with a lightweight and sturdy aluminum telescoping handle system and smooth rolling wheels for easy mobility. If the situation doesn’t allow you to roll the bag, you can carry it as a backpack with the help of padded stowaway backpack straps. You can also take it as a duffel with the help of the side and top handles. The High Sierra AT7 comes with several compartments for convenient and organized storage of your different items. There are two interior compartments. The main one features a book-style opening with tie-down straps to ensure that your stuff stays in place throughout your trip. The second compartment is beneath the main one and offers additional space for your bulkier clothes, shoes, or other essential stuff. The bags also have several smaller exterior pockets, where you can keep small items like stationery, tickets, and iPods. The 1680-denier ballistic nylon of this bag is hardwearing and water-resistant. That means you don’t have to worry about your items getting damaged by various weather elements. The bag is also equipped with a uni-body wheel-housing, enhancing the safety of the bag’s exterior. Looking for the perfect travel companion for an extended expedition? You can’t go wrong with the Eagle Creek Gear Warrior. The features of this 91-litre capacity duffel bag with wheels make it a great choice for outdoor sports and adventures. The bag is equipped with an Equipment Keeper™ exterior elastic lash strap, which allows you to secure items clothing to the top of the bag. It also has lash points for attaching extra gear. There’s also a secondary compartment to save you the stress of putting your gear and clothes in one place. If you are a shopaholic, you’ll probably be returning home with more than what you travelled with. This bag will come in handy as the main compartment is expandable, providing 15% more packing space. You don’t even have to worry about the bag blowing out due to overstuffing, as the exterior and interior compression straps ensure that doesn’t happen. The Eagle Creek Warrior boasts Exo-Skeleton technology, which enhances sturdiness and boosts abrasion-resistance. So you have a bag that is durable, yet lightweight enough to be carried as a duffel. Moreover, you can roll it over virtually any surface, thanks to its oversized and treaded wheels. A notable shortcoming of this bag is the plastic buckles, which are prone to breakage and affecting the efficiency of the bag as a result. Moreover, the buckles on the compression straps and some grommets are somewhat fragile. Fortunately, the bag is covered by Eagle Creek’s No Matter What Warranty. You’ll be compensated for any defect you find in the bag. 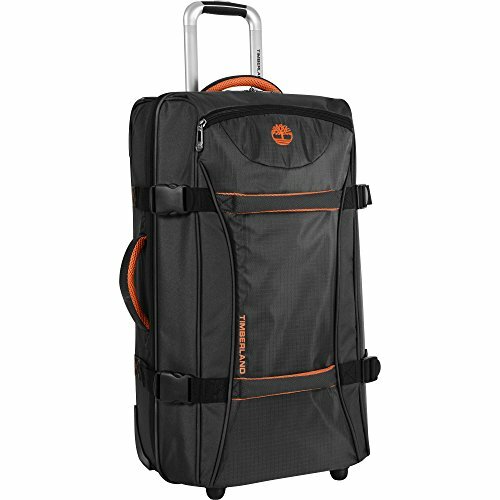 If you normally carry wet items and you don’t want to worry about them leaking through the bag, the Timberland Luggage Twin Mountain Wheeled Duffel can be a perfect luggage piece for you. It’s interior is lined with plastic to prevent any leakages. This bag is available in three sizes—22, 26, 30 inches—so you can choose one that best suits your needs. It features two separate packing compartments to keep your items organized. 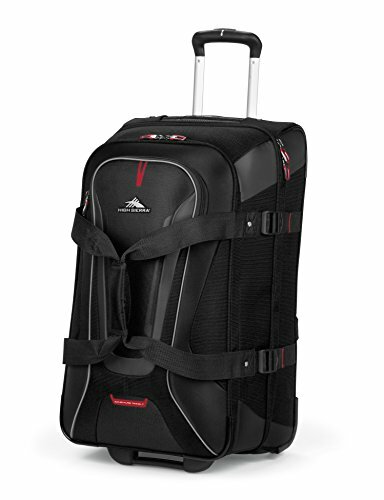 The compression straps ensure that your stuff is held compactly in place throughout your trip. If the situation doesn’t allow you to roll the bag, you can easily carry it as a duffel with the help of the side handles. The 600D polyester fabric is thin and lightweight yet durable and flexible. Moreover, the bag has self-healing zippers, so you don’t have to worry about the zippers splitting due to overstuffing. The bag boasts stable and sturdy wheels. There’s also a steel bar at the base of the bag. So, you can carry your heavy load with confidence that your bag has enough support and won’t give up midway. While the Timberland Twin Mountain offers several external pockets for keeping your smaller items, the pockets may prove unusable when the bag is completely filled. 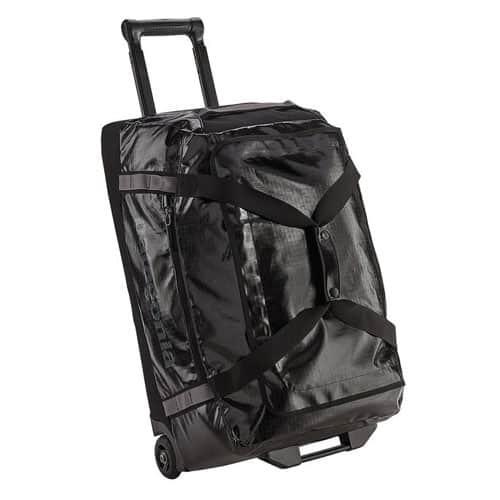 If you are looking for a budget-friendly rolling luggage piece with all the essential features of a duffel bag, look no further than the Samsonite Adante 22 Inch-Wheeled Duffel. This bag sports a modern look and a sporty feel thanks to the glossy polyester finish. The Samsonite Luggage Adante has several features that make it easy to use and handle. First, It has one spacious compartment that can be accessed through a U-shaped opening. With this opening, you can access every corner of the bag quite effortlessly. Secondly, there are extra pockets at the back and front, where you can keep your quick-access items like toiletries and stationery. Moreover, all zippers are lockable, so you don’t have to worry about the security of your stuff. The bag is also equipped with a push-button telescoping handle, which locks at various heights according to your personal preference. Coupled with inline wheels, the telescopic handle makes the luggage piece easy to move around. What’s more, the bag comes with padded top and side handles, which make it easy to carry when you can’t roll it. The shiny polyester material also enhances the bag’s overall durability so you won’t buy another bag in many years. The polyester exterior is also water resistant, and when dirty you only need a damp cloth to wipe it clean. The bag also features a bottom runner and end bumpers, which safeguard it from any abuses you may subject it to as well as potential wear and tears.